Since it’s a Monday, and it’s a holiday with a lot of folks being busy….here’s a fast little no-fuss video. Three colors of paint – Permanent Yellow Deep, Transparent Pyrrol Orange, and a little Lunar Black. In, out, done – go get candy! Watch the video below or click HERE to see it in HD on YouTube. 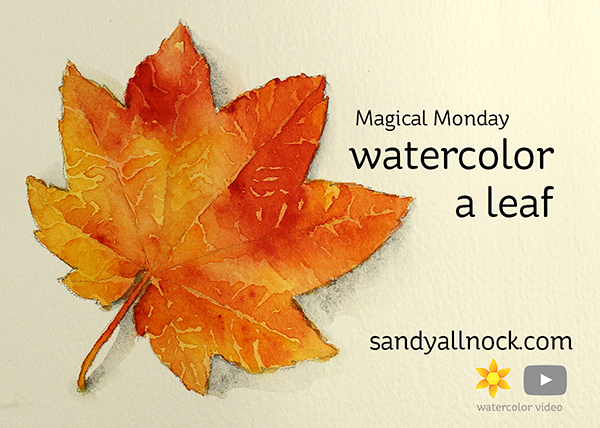 Sandy, I loved watching you paint your leaf. I wish it was easy to do as you make it look. But I know it’s not! Even more beautiful than the real leaf!!! Beautiful leaf! I just bought a couple of your prints. I didn’t realize that you even sold them. You need to get that out there a little more. I am so excited to get them. Wow! What a beautiful leaf, Sandy! So so gorgeous! Your leaf looks REAL!!! Amazing work! Fantastic. Your watercolor leaf is so lifelike! I hope I will learn something from your classes. Wow, you are amazing. Your painting is just as beautiful as the real thing. Looking forward to learning how to do this in your class! Beautiful colors. We don’t see those here in South Texas! Looks just like a photo. Mother Nature is pretty amazing – anybody who can copy that is pretty amazing, also!